Pannekoek, Frits. "Canmore". The Canadian Encyclopedia, 09 May 2016, Historica Canada. 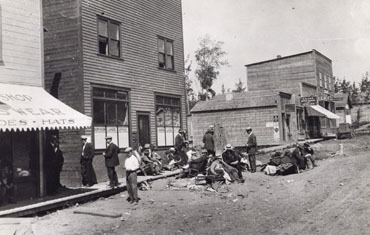 https://www.thecanadianencyclopedia.ca/en/article/canmore. Accessed 22 April 2019. Canmore, Alta, incorporated as a town in 1966, population 12 288 (2011c), 12 039 (2006c). The Town of Canmore is located in the foothills of the Rocky Mountains, five km east of BANFF NATIONAL PARK. Canmore, Alta, incorporated as a town in 1966, population 12 288 (2011c), 12 039 (2006c). The Town of Canmore is located in the foothills of the Rocky Mountains, five km east of BANFF NATIONAL PARK. 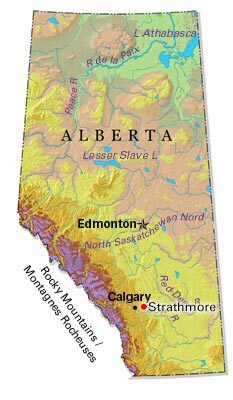 In 1883, Canmore, named after King Malcolm Canmore, Scotland, became the first divisional point for the Canadian Pacific Railway west (106 km) of Calgary. The railway and the coal mines first developed in 1886 were the mainstays of the local economy. By 1891 Canmore was flourishing. The mines were, however, closed by serious labour unrest in the 1920s and were affected by failing markets in the 1930s and again in the late 1960s and early 1970s. By 1979 all the mines had closed down their operations. The first Presbyterian Church in Canmore (now a provincial historic resource) was built by the Reverand Charles GORDON (aka Ralph Connor). Today Canmore is a growing recreation and tourism centre. The Canmore Nordic Centre, a state-of-the-art winter sports facility, was developed for the 1988 Calgary Olympics by the province of Alberta. CanmoreThe official website for the Town of Canmore, AB.